What is a dark nebula? Dark nebulae are, well, dark. They look like black blobs in the sky. They are generally dark because they contain mainly cold, high-density, opaque gas, as well as enough dust to quench the light from stars behind them. One example of a dark nebula is the Coal Sack Nebula, located near the constellation Crux (The Southern Cross). 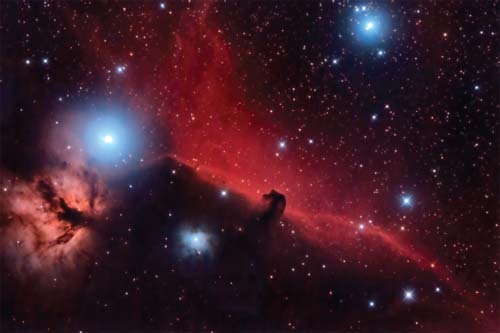 The Horsehead Nebula is named for the distinctive shape in its midst that is actually a dust cloud blocking part of the light from the nebula.